This ESL lesson plan contains activities and games for practising the present simple with elementary level students (A2). Feel free to use these activity ideas in your ESL classes. And don't forget, if you use an iOS or Android device, you can get offline access to these materials through the TEFL Handbook app. 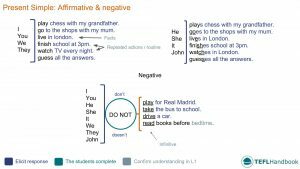 The focus of this sample ESL board work is on the grammar of the present simple along with its basic uses. As usual, it's colour-coded to suggest how the student-teacher interaction may play out in ESL classrooms. Here are several activities that can be used to practise the present simple. If you know of any more, let us know through the site forum. Teacher: Do I speak Chinese? Teacher: (After writing ‘I don’t speak Chinese.’ on the board) Is this a fact, or routine? I don’t go swimming in the morning. I get up at half-past eight. I don’t play sports in the evening. This ESL speaking activity builds on the work from the previous exercise. Students will swap books with a partner and take turns reporting on each other's present simple sentences in the third person. Student A: I don't like eggs. Student B: She doesn't like eggs, and I live in Spain. Student C: She doesn't like eggs, he lives in Spain, and I don't have a skateboard. If any student makes a mistake, we start again. Change the starting point each time. If you're in need of further ideas for ESL games and activities, check out this list by teach-this. You'll have to become a member to get full access, but there's still plenty of useful ideas there for free. Also, 56 fun classroom activities for the Present Simple tense over at UsingEnglish is a comprehensive list of activity ideas for teaching present simple at a range of language levels. If you're looking for worksheets, islcollective have over 1000 free worksheets on the present simple tense. We think the present Simple exercises sheet complements this lesson plan nicely. As for a video, we feel that this explanation of the present simple from Cambridge University Press ELT is the perfect addition to any classroom equipped with internet and video. Our suggested next lesson is on questions with the present simple. Be sure to check out our full list of ESL lesson plans for intermediate students, A2 lower and A2 upper, as well as our complete selection of EFL - ESL lesson plans. If you use an iOS or Android device, have a look at the TEFL Handbook app. An ESL lesson planner for English teachers. It has a lot more content and gives you faster access to our ESL resources, making it easier to use in class.